Muscle-flexing by the People’s Republic of China (PRC) is propelling a shift in regional power dynamics and contributing to militarisation of the Asia-Pacific region. This new reality ought to be a wakeup call for Australia to strengthen its defence sector by engaging with India. 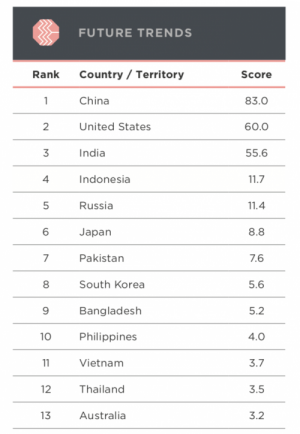 The Stockholm International Peace Research Institute’s FactSheets and the Lowy Institute Asia Power Index 2018 suggest that Australian policymakers need to ensure that the country does not fall behind its neighbours and that it protects its national interests in the Asia-Pacific region. Five of the top 15 global military spenders in 2017 are in this region. The PRC accounts for 13 per cent of the global military expenditure and 48 per cent of the region’s. Move the spotlight on Australia and the narrative changes. Australia is the only country from the region to have levelled down from rank 12 in 2016 to rank 13 in 2017. Despite being an island country, Australia ranks as low as 54 in terms of total naval strength according to Global Firepower. 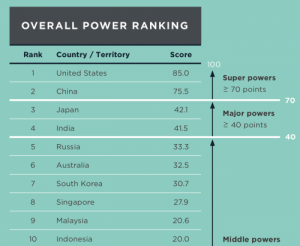 Nine countries from the Asia-Pacific region make it to the top 20 on the same list and similar trends are evident from the Lowy Institute’s power project. The pace at which the PRC is instigating this shift and the surmountable gap between the performance levels of the South-East Asian economies and Australia’s only make the situation more severe. Australia is being outperformed and tumbling into the middle-minor power bracket. Such a future could reduce Australia’s bargaining power with other Asia-Pacific nations, with the PRC presumably having more control over any interaction and transaction. Australia may soon be too militarily weak in comparison to the PRC to have much voice by itself, despite its alliance with the United States of America. The PRC has already announced an 8.1 per cent increase in its 2018 defence spending and deployed missiles on disputed features in the South China Sea. With an alleged range of over 200 – 300 kilometres, these missiles can aggravate Australia’s security concerns by hindering the movement of American military deployments in the region. The PRC has also committed aid for 218 projects in the Pacific Island countries valuing US$ 1,781.2 million over 2006 – 2016. The PRC’s increasing investment in these states can infringe upon Australia’s political and economic interests. Australia needs greater decisiveness and diversification. The PRC has been asserting its influence in the region for a while but it is now seemingly close to impinging upon Australia’s natural sphere of influence and security. The Australian Department of Defence, whose two enduring purposes include protecting and advancing the country’s strategic interests, needs to be proactive. 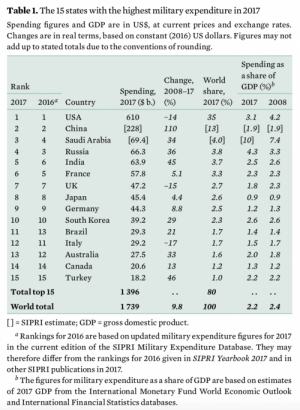 Although the government intends to increase its defence expenditure to 2 per cent of the gross domestic product by 2021, it needs to hasten the decision-making process and catch up with its neighbouring states. The current plan to launch the Shortfin Barracuda submarines around 2030 may not be soon enough to cover or reduce the capability gap with other countries in the region. The Department of Defence also needs to enhance security cooperation with India. Australia runs the risk of damaging its ties with the USA or Japan if it were to consider defence collaboration with the PRC. This risk could be averted by engaging with India that (unlike the PRC) is a pluralist democracy and closely aligns with USA and Japanese political culture. India is also deeply invested and interested in the stability and security of the Indian Ocean – a reality that integrates perfectly with Australia’s Indo-Pacific vision. India has a US$250 billion military modernisation plan in process and tails closely behind the PRC as a projected major power. 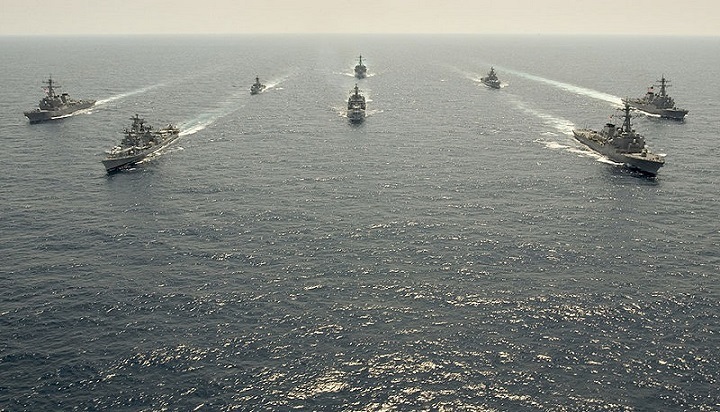 Joint military training camps at Australian bases, intelligence sharing and more naval exercises with India could help Australia develop its standing in the region without destabilising existing relations, and mitigate fears of a potentially hegemonic PRC. Countries in the Asia-Pacific region may be politically and culturally diverse but they appear to be united in their drive for more guns, plausibly less roses. Australia needs to enhance its defence profile and overall power index by engaging with India, and safeguard its national security midst a militarising region spearheaded by the rise of the PRC. Aarti Sharad Seksaria is studying toward a Masters of International Relations and tutors Indian Foreign and Security Policy at the Australian National University.